Every San Diego company has a unique story to tell. 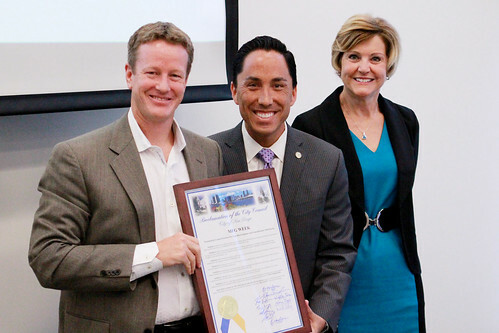 That became very apparent as the region came together to celebrate MFG Day at San Diego City College on Friday. Four panelists representing a diversity of San Diego companies talked about the challenges and opportunities facing the region’s manufacturing sector, which employs more than 90,000 individuals. Take D&K Engineering, a high-tech manufacturer. When the entrepreneurs who created EcoATM were looking to make their idea a reality, they went to the Rancho Bernardo firm to create an e-recycling kiosk. As a result, D&K Engineering had to scale up its production and hire more employees. And they chose to do it in San Diego. “Access to talent and the border opportunities are one of the main reasons I chose to start D&K in San Diego. Besides, who wouldn’t want to live here?” said Alex Kunczynski, one of the company’s founders. The border also adds a significant competitive advantage for local manufacturers. As Interim Mayor Todd Gloria said in his opening remarks, “this is a big deal.” San Diego and Tijuana are currently working together like never before. When asked about why Taylor Guitars chose to open up a manufacturing facility across the border in Tecate, VP of Manufacturing Chris Wellons said “We have a saying at Taylor Guitars. We say ‘We’ll we be happy we did this in 10 years.’” And happy they are. Manufacturing in Mexico, as opposed to China or somewhere else overseas, has given Taylor more control over its finished product. It’s also become more cost competitive. Wellons alluded to the entrepreneurial spirit of another panelist. Stephan Aarstol started Tower Paddle Boards - a sports and active lifestyle company - in 2010. With a little help from ABC’s “Shark Tank,”he transformed his sales from $3,000 in 2010 to $3 million in 2013. Although he only has four employees in San Diego, he plans on growing in the coming years, and he’s looking to do it in the region. To him, he’s not just selling a paddleboard but also exporting California culture to consumers all over the globe. As Chris Wellons of Taylor Guitars echoed, keeping manufacturing jobs close to home really comes down to innovating the process. Taylor Guitars has more than 700 employees, with many of them working out of its El Cajon headquarters. Although customers can still rely on the same quality that made Taylor a household name when it was founded in 1974, the manufacturing process has evolved. Taylor used to carve each of its guitar necks out of an individual piece of mahogany, meaning 60 – 70 percent of the materials were wasted. In 1999, Taylor decided that process needed to change. The result was one of the greatest guitar innovations in the past 100 years. Instead of using a one-piece neck, Taylor switched to a three-piece neck, which resulted in a 66 percent yield in materials and created a more sustainable product. This, Wellons said, was possible because of the ability to execute a vision, which he thinks is a strength of San Diego. So what can San Diego do to continue incubating manufacturing? The answer may be easier said than done. San Diego is fortunate enough to have a highly-educated workforce. The metro currently ranks fourth in the U.S. for Ph.D. attainment rates. Although Ph.D.-trained workers are essential for many San Diego sectors, as the panelists noted, it’s not necessarily these types of jobs they have trouble filling, but the machinist jobs where workers require hands-on manufacturing skills. Wellons learned these skills in his high school shop class, and so did many other highly-skilled manufacturers. Admittedly, we focus a lot of time on retaining and incubating high-tech talent, but as Interim Mayor Gloria pointed out “These jobs are important too. They provide a comfortable middle-class life.” San Diego City College provided the perfect backdrop to get this conversation going. As San Diego Community College District Trustee Peter Zschiesche noted, 98 percent of San Diego City College grads remain in San Diego. With the guidance of San Diego Community College District and organizations like San Diego Workforce Partnership, San Diego – and it’s nearly 2,800 manufacturers – are looking to put these grads to work. Of course, this all starts with the conversation we had this morning. A conversation that I’d bet we’ll be happy we had in 10 years.